Have a big sale, promotion or just want to get your business in front of every single user? This is by far one of the most powerful tools available to use. $150/ per Push Notification: Limited inventory based on date/time - the Local Explorer only sends a variable pre-defined number of push notifications per day. 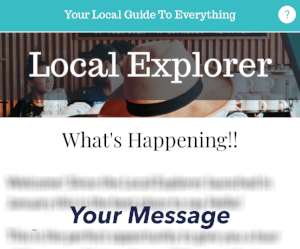 $300/per 5 days "What's happening": Place your special event or message directly on the main home page of the Local Explorer App. It's the equivalent of being on the front page of a newspaper. Impacting!